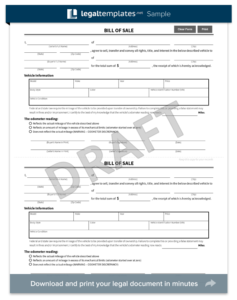 Use our attorney-drafted IL Bill of Sale to document the sale or transfer of ownership of an item such as a car, boat, horse, firearm, or other personal property from a seller to a buyer. Illinois law does not require a vehicle bill of sale, which is a legal document that acts as a receipt and shows when ownership switched hands, when it is purchased from an in-state dealer or individual. However, new Illinois residents who lease vehicles must submit out-of-state titles or other proof of ownership, such as a bill of sale, when they apply for a title and registration. Though Illinois does not require a bill of sale, there are benefits to creating and keeping one for your records. Namely, it includes important information, such as the buyer’s and seller’s contact information, the date and location of the purchase, and the sale price. Maintaining a record with this information protects the seller if the buyer abandons the vehicle or fails to register and title it. Additionally, this document serves as a receipt for the buyer, as well as a helpful document that they can refer to when they are completing their taxes. In Illinois, taxes must be paid on all vehicle sales. Taxes are based on the model year of the vehicle if the selling price is less than $15,000 or on the selling price if it is more than $15,000. The buyer and seller should keep copies of the document as proof of the transaction. It is not required to have the document notarized; however, doing so adds credibility to a document. The Illinois Secretary of State Driver Services recommends writing the form in English. Illinois requires that an owner submit the state-provided Junked Vehicle Bill of Sale (VSD 658), along with a Certificate of Final Disposition (VSD 657), if he/she has the lost the vehicle’s title certificate and plans to send it to a salvage yard. The state will not accept any other bill of sale for junked vehicles. In addition to mandatory insurance laws, Illinois requires all vehicles to be titled and registered after purchase. With the Electronic Registration and Title (ERT) System, you can complete and print an Application for Vehicle Transaction(s) (VSD 190) online. Also, you may obtain title and registration applications by visiting most Illinois Secretary of State Driver Services facilities. The application must be accompanied by the out-of-state title or other proof of ownership, such as a bill of sale. If you recently bought and have not titled or registered a vehicle you are bringing with you to Illinois, you must complete appropriate tax forms. Tax form RUT-25 must be completed and submitted along with a bill of sale to the Illinois Secretary of State’s Office if the vehicle was purchased from a dealer. Along with these documents and the application for vehicle registration and title, you must submit any applicable taxes payable the Illinois Department of Revenue. If the vehicle was purchased or gifted from an individual, tax form RUT-50 (Vehicle Use Tax Transaction Return) must be completed and submitted with the registration and title application and any applicable taxes. If the department is questioning the vehicle’s purchase price, you can submit RUT-49 in lieu of a bill of sale. The seller and purchaser must sign RUT-49. Any person who purchases a used jet ski or personal watercraft or watercraft classified in Illinois as Class 2, 3, or 4 from a retailer or individual in Illinois must submit a boat bill of sale and a number of other documents, according to the Illinois Department of Natural Resources. In addition to these documents, if you bought a watercraft from a retailer, you must submit a RUT-25 tax form. You must also submit a RUT-75 tax form if the purchase was made from an individual. In Illinois, a private seller of a firearm must contact the Department of State Police and determine whether a potential buyer/transferee has a valid Firearm Owner’s Identification card number before they can legally sell or transfer a weapon. State police must approve the validity of the FOID number before a firearm can be transferred. Firearm transfers that are transferred as gifts to spouses or relatives, as well as transfers made at a federally-licensed firearm dealer’s place of business, are exempt from this law. It is also beneficial to include information about disclosures, sale price, and any mechanical defects. Though not required, it is recommended that buyers and sellers maintain copies of each other’s identification. In addition to the state law, Cook County requires individuals to submit a Lost, Stolen, Destroyed, or Transferred Firearms Report within 48 hours of no longer having the weapon.